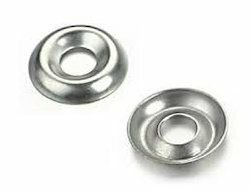 We have a wide range of Counter Sunk Washers that are availble in different sizes. A formed circular washer designed for use with flat or oval head screws. A raised type of finishing washer which is convex shaped. For use with 82º countersunk screws. They are specifically designed for accommodating the heads of countersunk screws. It provides additional bearing area on the material being fastened and can be used to give a neat, finished appearance. Sizes: According to customer’s requirements. Material: Stainless Steel & Mild Steel. Can also be made in the other materials as per cutomer's requirements. We have made the footsteps for others to follow when it comes to the production, manufacture, export and supply of precision turned components and engineering products. Our wide range of precision turned components and engineering products, high quality standards and excellent infrastructural facilities have helped us to grow by leaps and bounds. We were established in 1975 by Mr. Atul P. Sheth. Our quality fasteners, rivets, bushes, inserts, studs, bolts, nuts, metal fasteners, pins, grub screws, threaded bars, cup washers, machined cup washers and machined steel cup washers are manufactured in three manufacturing units having area of massive 2000 sq. feet and installation capacity of 10000 units. We manufacture precision turned components and engineering products with the use of modern and efficient machineries viz. Automatic Traubs, Lathes, Press, Drilling and Tapping machines. Our highly qualified and multi skilled team of professionals examin the production process and the stringent quality tests with the strict accordance with governmental safety and quality standards. We are very proud to claim that each of our fasteners, rivets, bushes, inserts, studs, bolts, nuts, pins, grub screws, threaded bars are approved by 9001: 2000 quality management system.